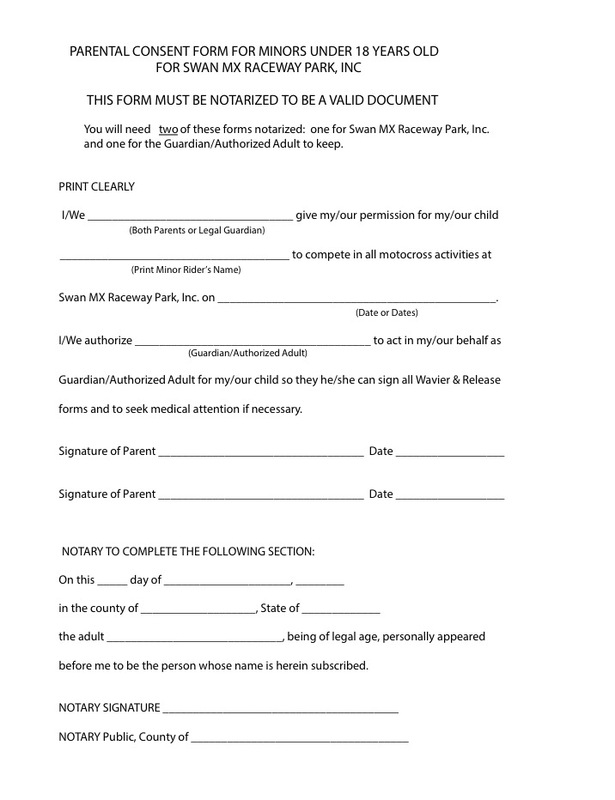 All riders under 18 years MUST have a parent present to sign a release. Or you may bring a NOTARIZED release signed by a parent. AN UNACCOMPANIED MINOR WILL NOT BE ALLOWED TO PRACTICE OR RACE UNLESS THEY HAVE A VALID CONSENT FORM. NO RELEASE = NO RIDE! If you will NOT be coming with your child to the races, you must send them with a NOTARIZED Minor Release and list a legal guardian, along with their phone number written beneath their name. This person will be your child’s legal guardian for the race weekend and needs to be present during registration to sign your child’s entry form. An older sibling, neighbor, friend, or relative may NOT sign releases for a rider, unless they have a NOTARIZED RELEASE from the rider’s parents authorizing them to do so. NOTE: In order to make your minor’s release valid for the entire year, be sure to fill out the date blank using the RACE DATE – DECEMBER 31, 2019. We will then keep it on file so you will not need to fill one out at future events. * We do NOT have a notary onsite. You may take your consent form to a bank, library, or some UPS stores to get it notarized.